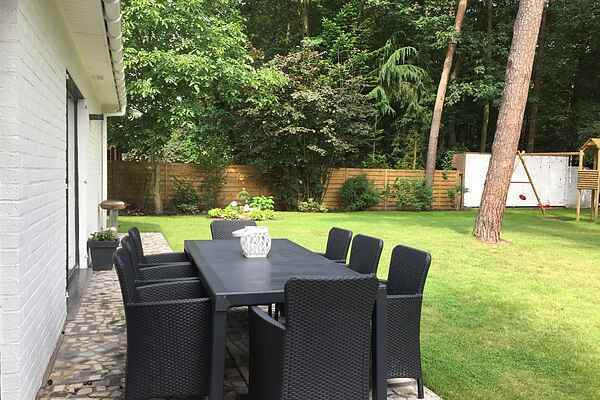 This beautiful detached house is located in a residential district in a very green and forested setting. It is furnished in a modern design and equipped with all the luxuries. There is a large garden that borders the forest which is completely fenced. The garden is a wonderful place for the kids to play. The terrace is great for enjoying a fun barbecue with your whole group after a day out. An ideal base for relaxing and enjoying the area's great natural beauty on a long hike or lovely bike ride. Brasschaat is a park town that really values its natural scenery. You will find an abundance of forests, ponds, castles, rose gardens, sunbathing meadows and zoos, plus a children's farm and lots of cafes and restaurants. If you prefer a somewhat more active holiday then you will find tennis clubs, a water park, an equestrian centre and (miniature) golf courses in the immediate vicinity. The kids can romp to their hearts' content in one of the area's many playgrounds. And don't forget: there is fantastic shopping in Brasschaat and environs! There is a child-friendly restaurant with a little playground next to the house. Be sure to visit the vibrant fashion city of Antwerp as well.